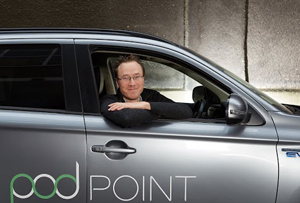 Erik Fairbairn hopes POD Point will get the wheels in motion for mass take-up of electric vehicles. You might not expect the founder of a supercar club renting out Ferraris to move into the world of electric cars, but Erik Fairbairn felt he had some making up to do. ‘I did once calculate the total amount of carbon emission that my supercar club [formerly ecurie25, now Auto Vivendi] created and it took POD Point over four years until we’d offset the same amount of carbon through electric vehicles,’ he says. 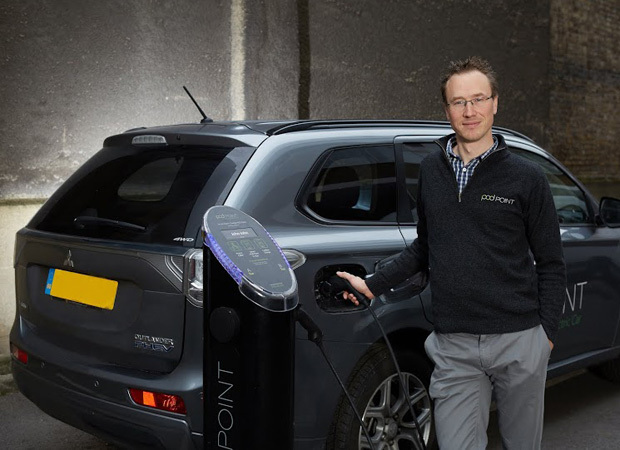 POD Point is Fairbairn’s current venture – billing itself as ‘wiring up the UK for the electric vehicle revolution’. The 65-strong team is working on a public network and has shipped over 20,000 charge points to date, leading to 300 public bays being set up. It sells points to supermarkets, home offices and destination points, including David Lloyd and Heathrow and also leases points from £40 a month. The company sells chargers for home use too. The government has a £500 grant for home units, which covers around half the price - POD Point sells them from £390 and offers installation. Despite there not being many electric vehicles on the market at the time, he managed to sell POD Point’s first batch of charging points to Tesco in 2009. ‘I thought if we managed to sell a couple to a big company like that, maybe we’re onto something.’ Initially though, it was a difficult market and Fairbairn says flexibility was the key. 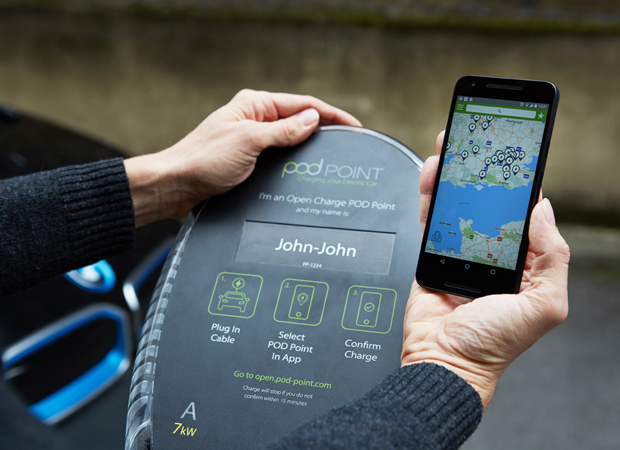 ‘We had to go where we saw sales opportunities.’ After a couple of years, more vehicles were rolled out and POD Point was then able to concentrate on its original strategy of building a network of charging points. And Fairbairn is confident – unsurprisingly – that the electric car market is only going in one direction. ‘I have this vision that we’ll have a 200 mile range car by 2020 that will cost £20,000 and I think we’re very much on a trajectory that will get us there,’ he says. ‘That’s where mass market appeal of the electric vehicle really happens.’ POD Point's turnover last year was £6.5m and Fairbairn says the aim is to reach £50m by 2020. He thinks that’s ‘very achievable’ when considering the growth rate of electric vehicles. As with any new technology, there have been teething problems. Volkswagen recently recalled thousand of its e-Golf cars in the US due to a problem which could switch off the motors while in use (as if it wasn’t having enough problems at the moment…). That follows unrelated recalls by Nissan and Renault in recent weeks. But Fairbain thinks the more obstructive troubles impeding mainstream take-up are price and access to charging points - the roll out of which has been hindered at some points by planning permission. ‘There’s no technological restriction – you can buy a Tesla today and it will do 250 miles on a charge and can go faster than anything you point at,’ he says. ‘The negatives of a Tesla are that it’s quite expensive – you can’t get anywhere near one unless you’re at £50,000 to £70,000,’ Fairbairn explains. Elon Musk has though, just unveiled his lowest-cost car to date. The most basic version of a Tesla Model 3 will set you back $35,000 (£24,423) and has racked up a hefty waiting list, even though no one’s going to be able to buy it until the end of 2017. Fairbairn says the price of batteries is also coming down ‘about 15% in terms of cost year-on-year’, while POD Point is ‘working as fast as we can to roll out points across the UK’ to address the infrastructure issue. ‘My view is that 10% of the car market will be electric by 2020 and 85% will be electric vehicles by 2030 and we’ll see a mass rollout over the next ten years,’ he says. Though despite being billed as a significant step forward in terms of environmental impact, there have been queries as to how much better electric vehicles are in that respect. He thinks the combination of firms like POD Point building charging infrastructure, energy firm Ecotricity working to decarbonise the electrical grid and Nissan, Tesla and co. creating the electric vehicles has meant that ‘together we’re moving towards zero emission status’.